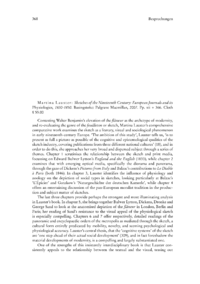 Contesting Walter Benjamins elevation of the flâneur as the archetype of modernity, and re-evaluating the genre of the feuilleton or sketch, Martina Lausters comprehensive comparative work examines the sketch as a literary, visual and sociological phenomenon in early nineteenth-century Europe. The ambition of this study, Lauster tells us, is to present as full a picture as possible of the cognitive and epistemological qualities of the sketch industry, covering publications from three different national cultures (18), and in order to do this, she approaches her very broad and dispersed subject through a series of themes. Chapter 1 scrutinises the relationship between the sketch and print media, focussing on Edward Bulwer Lyttons England and the English (1833), while chapter 2 examines that with emerging optical media, specifically the diorama and panorama, through the gaze of Dickenss Pictures from Italy and Balzacs contributions to Le Diable à Paris (both 1846). In chapter 3, Lauster identifies the influence of physiology and zoology on the depiction of social types in sketches, looking particularly at Balzacs LÉpicier and Gutzkows Naturgeschichte der deutschen Kameele, while chapter 4 offers an entertaining discussion of the pan-European moralist tradition in the production and subject matter of sketches.